We spent four days in the huge metropolis of Hong Kong, China. Although Hong Kong is officially part of China, it is very different than the rest of China. Hong Kong is a very modern, wealthy, ultra-dense city, with nonstop buildings, but it still has some great natural areas, as well as 100's of less crowded nearby islands. On our first night in Hong Kong we explored its energetic club scene with our friend from the Palace On Wheels tour (until 4 AM!). Except for the heat and humidity this time of year, and the high expense of existing in Hong Kong, we enjoyed it. We knew that going to Hong Kong would not have us experiencing 'real China', but we had already decided to skip the rest of China, so it was the closest we would get. Pursuant to an agreement signed by China and the UK in 1984, Hong Kong became the Hong Kong Special Administrative Region (SAR) of China in 1997. In this agreement, China has promised that, under its "one country, two systems" formula, China's socialist economic system will not be practiced in Hong Kong and that Hong Kong will enjoy a high degree of autonomy in all matters except foreign and defense affairs for the next 50 years. It is clear that Hong Kong, and especially Hong Kong Island, has experienced many years of prosperity. There are more skyscrapers than you can imagine. We were told that Hong Kong has the densest population in the world. We believe it given the huge number of massive buildings, but Hong Kong also has some land that is not developed. We found Hong Kong to be very expensive, especially relative to the rest of Asia. Even though the exchange rate was about 8:1 HKD:US, we still paid US$40-70 for meals, and at least US$300 in taxis. Fortunately, we did get great deals on our hotel rooms. Geographically, the New Territories and Kowloon section of Hong Kong border mainland China. Hong Kong Island is the main, and most densely populated island, although there are hundreds of other islands. We visited Kowloon, and Lamma Island, but spent most of our time on Hong Kong Island. The ferry system between the islands and with the mainland is very efficient, and we had no problem using it well. Hong Kong Island has lots of hills and several peaks. Many of the roads loop up tens of feet to multiple levels, and result in maximum efficiency in travel in such a confined space. We were quite happy to not drive in the town. It seems that most people take taxis, trains or buses, given the relatively low number of personal cars on the road. The main peak on the Hong Kong Island, Victoria Peak, provides a great view of the skyline, harbor, and Kowloon. On our second day in Hong Kong, we had lunch at the peak, and then walked the many trails around the peak. From these trails, we experienced great views of the tree-filled, less developed portion of Hong Kong Island, the hundreds of ships all around the harbor, as well as other islands. We figured that we could walk the 3 hour trail to the bottom of the peak and take a taxi back to the hotel. After we got to the bottom in about 90 minutes, we could not figure out how we could get to the main road from the wooded area -- there was a large reservoir in the way. So we walked all the way back up to the peak. Super tired, hot, and soaked through with sweat we caught a cab back to the hotel. Panoramic view of Hong Kong Island from the Kowloon ferry. Panoramic view of Hong Kong Island skyline and Kowloon, from Victoria Peak (on Hong Kong Island). Kristen on Victoria Peak on Hong Kong Island with the skyline in the background. 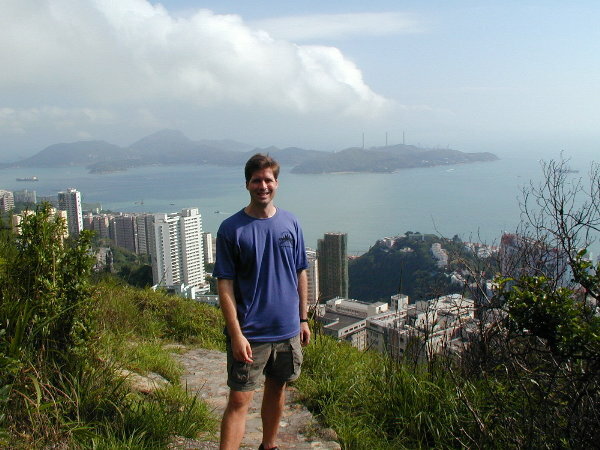 Dan on the path from Victoria Peak, with the southern part of Hong Kong Island in the background. View from our room at the JW Marriott on Hong Kong Island. 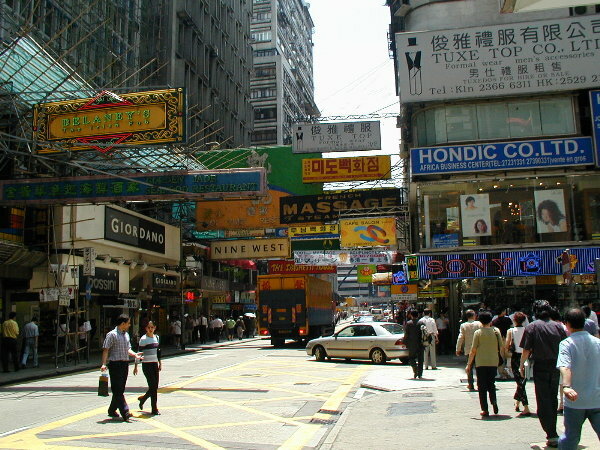 Street view in Kowloon. 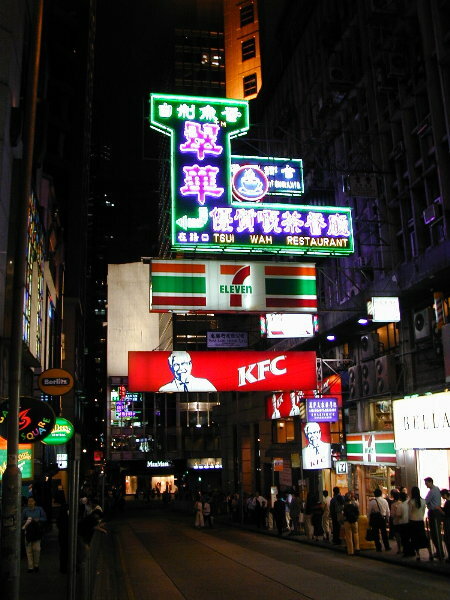 Kowloon is the part of Hong Kong on mainland China. Night street view near our second hotel on Hong Kong Island. Notice the friendly American establishments that were everywhere! Panoramic view of the beach on Lamma Island, a thirty minute ferry ride from Hong Kong Island. Kristen in front of the outstanding vegetarian restaurant in the town of Yung Shue Wan on Lamma Island. 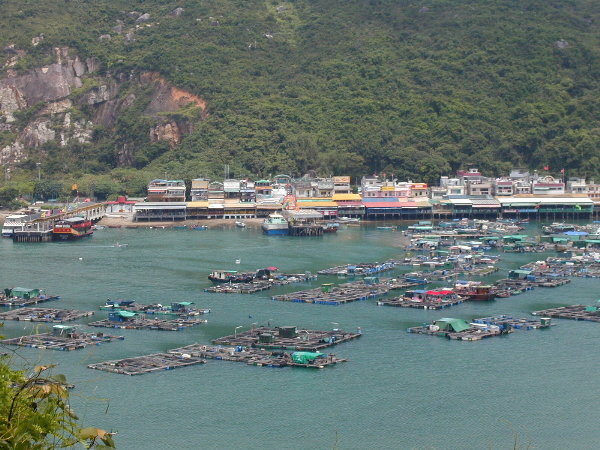 Sok Kwu Wan port on Lamma Island. We walked the hour+ path across the island from Yung Shue Wan. On the ferry from Lamma Island, a view of one of the many huge building 'clusters' on Hong Kong Island. This group of 20+ forty story apartment buildings are in the town of Aberdeen. Our view of the huge fireworks show from our second hotel -- clearly the view from our room was not good. 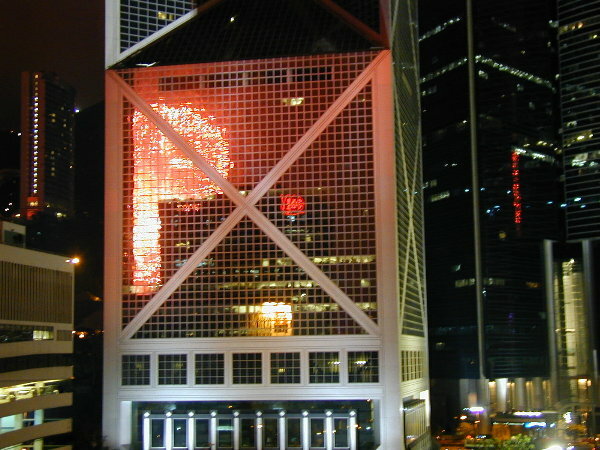 We believe the fireworks were for the Fortune Global Forum, at which the Chinese President spoke and Bill Clinton attended. On our first day in Hong Kong, Conor, our friend from the Palace on Wheels tour called to take us out on the town, since it was Saturday night. Even though we had traveled all day, and it was 11:30PM, we decided to meet him out. We went to the prime nightlife Lan Kwai Fong area, which is remarkably similar to the Buckhead bar/club area in Atlanta. We were amazed that most of the people were western, with very few Chinese nationals in the bars or walking/drinking on the crowded streets. We visited many bars and enjoyed a few bands, drank our first light American (not cheap) beer in four months, until we ended up eating Lebanese chicken kabobs at 4AM -- a great night! We decided to visit one of the less populated islands while in Hong Kong. We chose Lamma Island on a whim, and took the 25 minute ferry ride near lunch time our last day. We had read that the island is believed to be the first island inhabited, over 5000 years ago. There are only 3000 residents officially on the island (although we read that there are 9000 people in actuality), and it is considered a hang-out for 'hippies'. 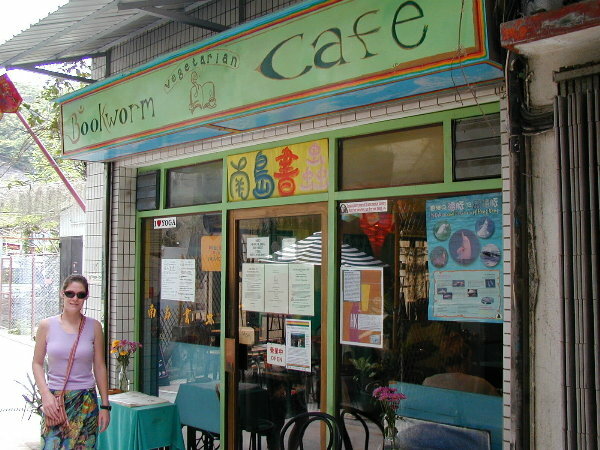 We searched for a lunch spot, and stumbled on the Bookworm Vegetarian Cafe. It was the only place that was not a seafood restaurant and since the smell and sight of all the seafood on the main street was less than appetizing, we decided it was the best choice. The food was outstanding, and we sat there for a long time, enjoying a very 'granola' experience. We had heard that we could walk about an hour through the island to the other port serviced by the ferry back to Hong Kong Island. After over an hour on this very hilly, but well-marked trail, we were sweaty and tired. We reached the port, just in time to watch the ferry pull away from the pier. Since the next ferry to our part of Hong Kong Island was not for two more hours, and we did not have the energy to walk back to the first port (where the ferry ran more frequently), we caught another ferry to the far side of Hong Kong Island and taxied back from there. Because we were on Lamma Island out last day, we missed the internationally covered Fortune Global Forum, taking place on Hong Kong Island, during which Jiang Zemin, the President of China, spoke, and Bill Clinton attended. When we were out later that night, we saw the hundreds of police/army all around our hotel area -- the forum was 100 feet from our hotel. Later we heard the huge fireworks display in celebration of the forum, and caught glimpses of it reflected in the glass wall of a nearby hotel. We flew from Chiang Rai, Thailand, to Bangkok, then to Hong Kong in the same day. Even though this approach meant we had a several hour layover in the Bangkok airport, we thought it would be ok because the Bangkok airport is quite modern. Unfortunately, we could not get past the check in area with all our bags, because we couldn't check-in for our flight until 4 hours before the flight. So, we took the time to change the dates/times of future flights at the sales counter, but still stood at the empty check-in counter for over an hour. One we checked in, we were able to get into the first class lounge so the rest of the layover was fine. The airport in Hong Kong is absolutely huge, dwarfing even Atlanta's Hartsfield airport. We walked (partially on moving sidewalks) for 15 minutes, then took a subway car, then walked another 5 minutes to get to immigration control. Although we could have taken a bus or a train for the 45 minute ride from the airport to Hong Kong Island, we decided to take a taxi, which cost hk$400! Considered one of the nicest hotels on Hong Kong Island. We agree. 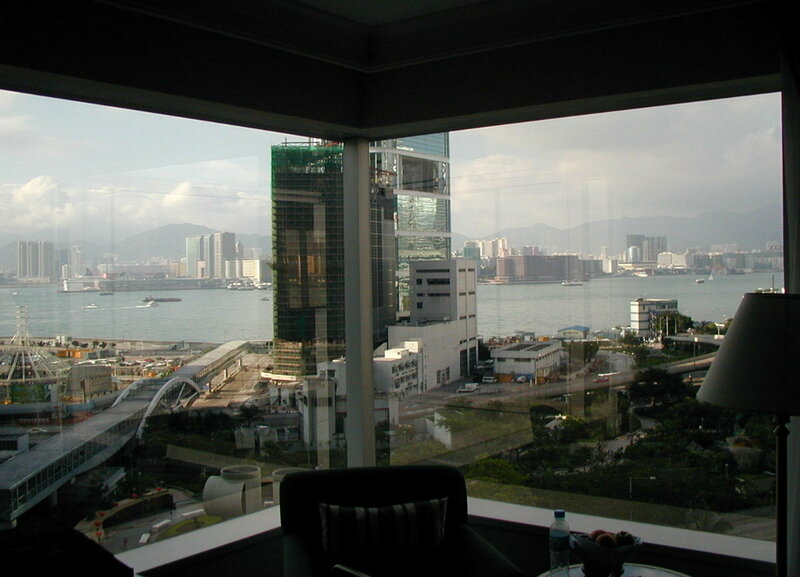 A bit older hotel, but a great location, with a clear view of the water/Kowloon, and a 5 minute walk to the ferry.